No matter what you do for a living or which age group you belong to, you need refreshments every now and then. And what better way to replenish your zeal for daily life than a well-organized trip? But the thing is, to “well-organize” a trip sometimes takes the enjoyment out of a trip. There are so many things to decide on, and so many things to keep track of. That’s where Google Trips comes in. Just announced, the app, as the name suggests is googles idea of a virtual tour guide. A personal tour guide to be at that. In their official blog, Google referred to a study by GoodThink that shows 74% of the travelers feel that the most stressful planning aspect of their trips are figuring out the details. In an effort to change this and make it easier for people who travel, Google released trips which will organize those very stressful details. From flights to hotel reservations, from famous places to visit to cultures to explore, Google trips has you covered from departure to return. And Google wanted to make all this as personal and intricate as possible. You can use both your home and work accounts to pull information that may improve recommendations such as favorite places on Google Maps. You can even use the recommendations your friends sent you. Sure, everybody has a few things common in every trip. But other than those few things, trips and how well they feel are very subjective. Hence the integration of personal accounts will make everything smoother for the user. Google has even automated the accumulation of your trip emails in one place. So no more last minute shuffling to 500 e-mails to find that “One”. Google has made sure that it uses all the resources at its disposal, as in all the Google services. Google Trips’ recommendations will change varying on the weather. If it’s raining it will recommend indoor activities and if it’s a brisk shiny day, likewise. And here is the best part. It works offline. Google knows about the ridiculous data plans abroad and the problems that creates. So all features within Google Trips will work offline. Although, internet availability will certainly enhance the experience as the app can pull down real time information. The services of the app are currently limited to some 200 cities around the globe. 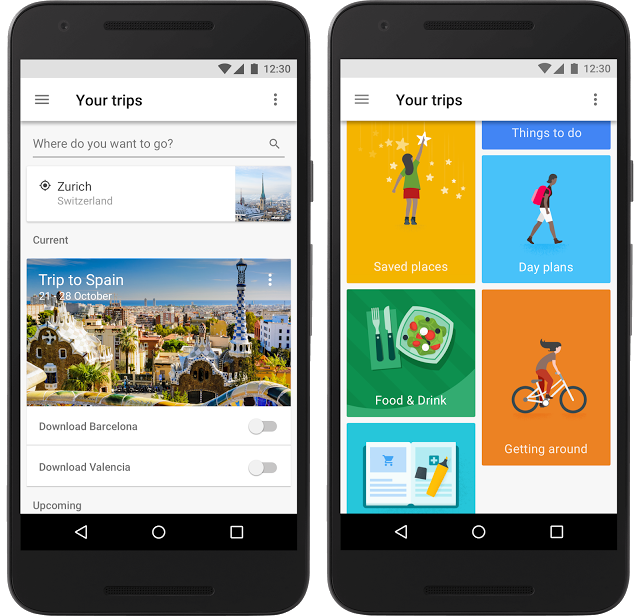 Google Trips is available for Android and IOS and its completely free. Another thing to admire.